Last Thursday, the CPT Iraqi Kurdistan team held a press conference at Sulaimani's Culture Cafe to formally release their latest report, "Disrupted Lives: the effects of cross-border attacks by Turkey and Iran on Kurdish villages." The report, available in .pdfs in both English and Kurdish, highlights how Turkey and Iran's attempts to combat the guerilla fighters along their borders often results in devastating consequences for Kurdish villages, from property damage to loss of life. 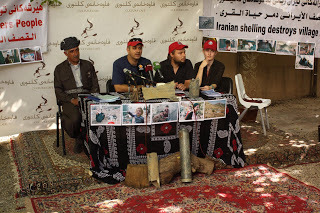 In compiling the report, the team also paid attention to the psychological effects the annual bombing and shelling campaigns have on the villagers, who are civilians and, and whose only involvement in the conflict between the guerilla groups and the Turkish and Iranian governments is living in the wrong place at the wrong time. Left to right: Bapir, Mohamed, Lukasz, and Carrie. On the table are photographs of shelling damage and displaced villagers, taken last year. Also on the table are exploded ordinances collected after attacks last year. CPTers Carrie and Lukasz presented the report, while CPT partner Mohamed acted as translator, and village leader Bapir spoke on behalf of over 20 different villages in his home region of Pshdar. Bapir urged those present not to forget Qandil, a mountainous region of Kurdistan. He warned that damaging the mountains and mountain villages threatens an integral part of Kurdish identity, and called on the Kurdish Regional Government to seek a solution. stressed the need for cooperation between villagers, local and international organizations, and media in order to bring the government’s attention to the villagers’ needs, and eventually an end to the attacks. A summary of "Disrupted Lives" is copied under the jump below, but we strongly suggest that you take the time to read the report itself. "This report details the effects of cross-border bombing and shelling from Turkey and Iran into the Pshdar District of Iraqi Kurdistan during the course of 2011. Information for this report was compiled from interviews and observations conducted by Christian Peacemaker Teams, from local news stories, and from three separate reports published by international human rights organizations in 2011. The findings in this report indicate a disturbing trend: that the Turkish and Iranian campaign to combat the guerilla fighters along their borders causes significant and lasting damage to villages, and the village way of life. Despite these governments’ claims that the attacks are directed toward guerilla fighters only, civilians suffer heavy consequences every year. Villagers have been injured and killed, livestock lost, homes damaged, and crops destroyed. The shelling and bombing seriously harms village life. Cross-border attacks became an annual event in 2006. As a result of the attacks, villagers are forced to abandon their homes each year, and live in IDP camps, where they have limited access to fresh foods, clean water, and proper hygiene. Moreover, by leaving their villages behind, many could no longer care for their crops, livestock, or houses, and suffered tremendous economic consequences as a result. Children, too, bear the burden of these attacks. Several schools were damaged from shelling, rendering them unfit for classes; they remain closed even today. Some children must walk over two hours each day just to attend school. These attacks, therefore, deny children access to an education, an international human right. Additionally, children are more likely to suffer from the poor hygiene in the IDP camps, and many cope with psychological trauma as a result of the attacks. While speaking with villagers, we heard them express real fear that their traditional way of life is in danger, that the continued attacks threaten not only their villages, but an integral part of the Kurdish national identity. Christian Peacemaker Teams would like to bring the world’s attention to the effects and consequences of these cross-border attacks, and calls on both Turkey and Iran to cease the bombing and shelling of villages, not just for this year, but for good."